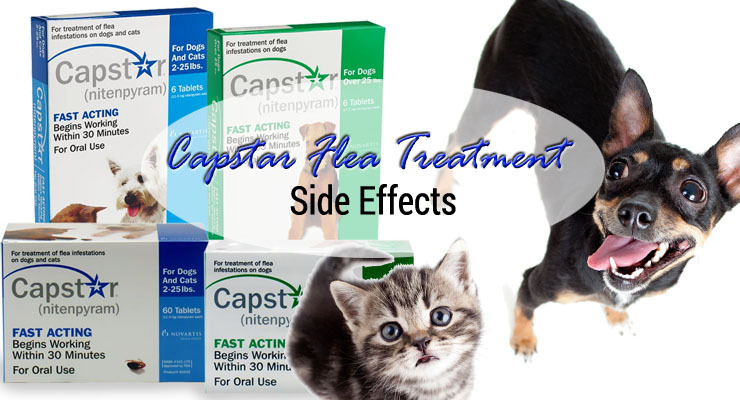 The Side Effects of Capstar (Nitenpyram) Flea Treatment: Is It Safe? Fleas are a nuisance to any pet and pet owner; so it’s important to find an effective flea treatment that works quickly. There are a wide variety of flea treatments and preventives out there for pets, so it can be difficult to find the right treatment for you and your pet. Households with both cats and dogs can face additional difficulty in finding a treatment that is sensitive for cats but still strong enough to eliminate infestations on dogs. One treatment that works to kill fleas on both cats and dogs is Capstar Flea Control. This treatment is available in multiple formulations to treat all cats and dogs that are at least 4 weeks of age and that weigh at least 2 pounds. Capstar comes in an easy-to-administer tablet and begins killing fleas within the first 30 minutes of its administration to provide fast-acting relief. This treatment kills adult fleas and can be administered as often as once daily to eliminate fleas in the case of re-infestation. It can also be used in conjunction with preventive treatments to provide comprehensive protection against fleas. The rest of this article intends to explore the side effects and risks associated with Capstar to help you make an informed decision when selecting which flea treatment is appropriate for your pet. Capstar is known to cause certain side effects with regular use, whereas other adverse reactions may be the result of inappropriate usage. Side effects also differ depending on which animal is being treated, as dogs and cats have different reactions to the treatment. The most common side effects that affect dogs include lethargy or hyperactivity, incoordination and trembling or seizures, and nervousness. Dogs may also experience excessive panting, vomiting, itching, inappetence, and diarrhea. Cats taking Capstar may experience many of the same side effects as dogs. Common side effects include hyperactivity or lethargy, excessive panting, itching, vomiting, inappetence, nervousness, diarrhea, seizures, and trembling. Other side effects that cats may exhibit include pupil dilation, increased heart rate, vocalization, fever, and salivation. Both cats and dogs may also experience an allergic reaction to the treatment that is characterized by hives, difficulty breathing, and swelling of the lips or tongue. There is also a risk that combining Capstar with other medications and treatments may lead to other adverse effects. The makers of Capstar, Novartis Animal Health, recommend using it in conjunction with Program- the company’s monthly oral flea preventive. Though Capstar and Program create a comprehensive flea treatment regimen for cats and dogs, there are other options available for both cats and dogs that offer varying degrees of protection against fleas and other pests. Capstar and Program may protect against fleas; but neither offers protection against ticks, mosquitoes, flies, or lice. For solutions that offer protection against these additional pests, you can look to other solutions such as K9 Advantix II for dogs, or Frontline Plus for cats and dogs. Both topical solutions offer up to one month of protection against fleas, ticks, and more. They also come in different formulations to ensure that you can find the proper dosage for your cat or dog based on their weight. We hope this article has helped inform you of the advantages and risks associated with Capstar and possible alternatives to this treatment so that you can find the perfect product for your pets!